Ukrainian army positions came under 61 attacks in Donbas over the past day, including 38 attacks conducted in the Donetsk sector, 20 in the Mariupol sector and three in the Luhansk sector, the anti-terrorist operation (ATO) press center wrote on Facebook on Monday morning. 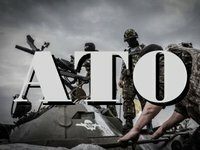 In the Donetsk sector, Ukrainian army strongholds were shelled by 122mm artillery in Pisky and Zaitseve, 120mm mortars forbidden by the Minsk agreements shelled Avdiyivka and Novhorodske, and grenade launchers were used against Ukrainian positions in Maryinka, Luhanske and Pisky, the report said. The militants fired 122mm artillery weapons, 82mm and 120mm mortars, grenade launchers, large-caliber machine guns and small arms in Shyrokyne in the Mariupol sector, while 120mm mortars bombarded Vodiane and Krasnohorivka, the report said. The militant's small arms were used against Ukrainian army positions in the area of Novooleksandrivka and Novotoshkivske in the Luhansk sector, the report said.